June 2015 issue of Reader’s Digest Magazine (India Edition) published quite on time and here are our views and reviews for the same. The editorial have emotional thoughts about the editor’s memories about his father. Sometimes we feel that the importance and contribution of a mother in a child’s life is rightfully given so much importance, but somehow the same of the father is not that much cherished. It is good to read about it. We like the motto: You can help others, if you have a will to do so, and we surely admire the people who does so. They are the one who shows real human qualities and makes the world a better place to live. The article under the title Dreamers is worth reading. It talks about how a newspaper selling boy Shiva got help of a kind fellow (whom he refers as “uncle”) against expenses for education. It made Shiva’s life, literally. We appreciate Shiva’s hard work and the uncle’s genuine help to him. In the days where you are bombarded with so many articles and stories exploring “wrong aspects” of society, such articles must not have gone unread and unnoticed. The – Lost And Found – article is about how we often misplace the things, and often found them when actually looking for something else. The article tells about real things, though it doesn’t add any values to reader’s knowledge. Health – segment is worth a read. 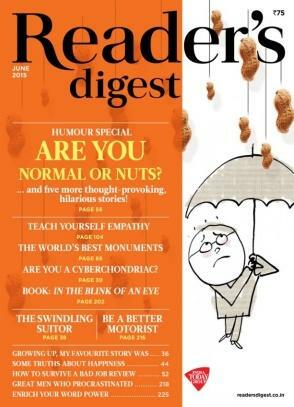 We didn’t find – Are you Normal or Nuts (the themed article)- much appealing. We expect something better for the same. Humour special – segment actually consolidates some articles from past decades under the title – how we laughed (during that period). It contains jokes and humours, most of them are found appealing even today. Potala palace is one of the finest palace in the world. Better known to be historical home of Dalai Lama, the palace is declared as a World Heritage site by UNESCO. The photographs shows the ethereal beauty of the same, and at the same time it reminds you about the wisdom it represents. It is definitely one of the best monuments mankind built. While looking at Potala Palace’ beauty, you must think of the workers who spent a lot of efforts to overcome the hurdles they faced while building the beauty. It is very tough to built such a marvel in so challenging place. Castle in the Sky – talks about another monument from Germany. Schloss Neuschwanstein is built around 122 years ago and is considered as the inspiration behind the Sleeping Beauty’s Disneyland palace. Rhapsody Blue, talks about the Blue Mosque of Istanbul. The beauty of Dubrovnik is discussed under the tile – The city of freedom. In addition, the same article talks about the painted churches of Romania. A single article talking about so many good places around the world is definitely worth going for. The Truck is On Fire – talks about a real life drama where a lady was under a burning vehicle. The article is written nicely by Katherine Laidlaw. The illustrations added to this article represents some of the incidents talked inside, authentically. Teach yourself Empathy – is a good article written by Roman Krznaric. The author tells a very basic thing – think about others before performing an action – via six habits we need to develop. The article contains more value for the teenagers who are the future citizens. It is of course applicable to all of us. …let the World Flow – talks about a lady writer who ultimately decided to follow her instincts. The article is about how rightly followed instinct can change a life. One need to develop the needed skills of course, while chasing the dreams. Cricket lovers find the photo of India’s world cup win (25 June 1983), a collectible picture. Snigdha Hasan’s – Me, papa’s pupil – is a daughter’s memoir which you will like to read. It is a small yet good article. A large segment of this issue is devoted to advertising feature. In the blink of an eye – is a classic story (published early in February 1998). It talks about Jean Dominique Bauby – the editor of Elle magazine – suffered a stroke and land into coma. When he get out of the same, his life was changed forever. A tale which makes you feel that, anything can happen to us anytime. Jean was died on 9 March 1997. He wrote his memoir which was published as The Diving Bell and the Butterfly. The book was a bestseller and is available for online purchase as well. The book was then adapted as a movie of the same name. You can read more about The Diving Bell and the Butterfly (film) here. 11 ways to perfect your driving – is a set of 11 basic yet effective driving tips, which are worth to go for everyone. The magazine have more positive aspects then the negatives. It is definitely worth going for. The readers will enjoy the article about health, inspiration, places around the world, good habits and generosity.